I have no idea why a movie like PRIEST didn’t click with audiences. It almost got by me as I tried to watch it twice and both times fell asleep maybe about twenty minutes in. It could be because I tried watching it late at night after a long and activity filled day. But I was advised to give the movie another chance. So I did and I’m happy to say I’m glad I did. There’s something utterly freewheeling about the way PRIEST takes three genres: The Western, Horror, Science Fiction and gleefully mashes them up into one big gloopy ball and throws it at you. Thanks to a marvelously gory animated opening sequence we’re educated into the history of the Great War between humans and vampires. And make no mistake, these aren’t your emo vampires who look for love and wistfully meander through eternal life longing to be human. Hell, no. These are frightening monsters that will rip your mollyfoggin’ head off and joyfully bathe in the fountain of blood spurting out of the stump. In this movie, vampires are truly a separate species, creatures without eyes that enthrall humans to act as their familiars. In this alternate universe, apparently the Catholic Church has taken over control of much of the world and has created a special order known as The Priests. Basically they’re Jedi Knights without lightsabers. Although they do have some pretty cool weapons such as throwing stars shaped like crosses. Thanks to The Priests, the vampires are defeated and placed on reservations while humanity retreats to the safety of high walled cities where The Church rules with totalitarian control. All those who do not wish to live under The Church are free to make a living the best way they can in the wastelands between cities. And The Priests? Not having any more use for them, The Church disbands them. Much like Vietnam veterans when they came home from that war, Priests are shunned and avoided. All this changes for one Priest (Paul Bettany) when he is approached by Hicks (Cam Gigandet) the sheriff of the town where Priest’s brother (Stephen Moyer) lives with his wife (Madchen Amick) and his daughter Lucy (Lily Collins). Vampires attacked the town and took Lucy. Hicks, who is in love with Lucy wants Priest to help get her back. Against the explicit order of Monsignor Orelas (Christopher Plummer) Priest leaves the city to go find his niece. 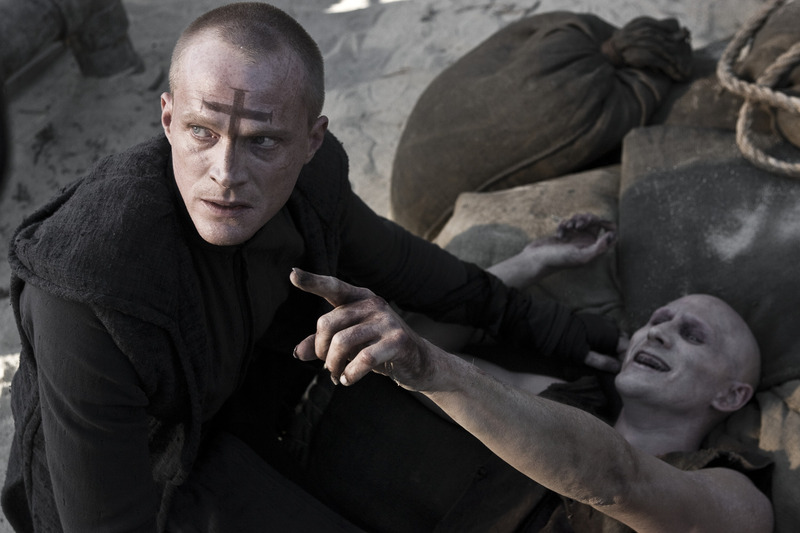 He finds a lot more once he discovers that his best friend and former fellow priest (Karl Urban) has been transformed into a human/vampire hybrid and has organized the vampires into an army. Using a train to transport the vampire army by daylight, the plan is to raid the walled cities one by one and renew the war between humans and vampires. Now, that’s not much, but considering the movie is a quick 87 minutes, how much do you really need? The movie makes no secret that it lifts its plot from the classic John Ford western “The Searchers”. Especially when Priest explains to Hicks his intention to kill his niece if she has been assimilated by the vampires in a scene that could have been swiped word for word and shot for shot from that movie. But there’s also a lot of other stuff taken from other movies and you can have a field day just looking for those. There’s some of the “Mad Max” movies thrown in here as well as some Kung Fu once Maggie Q joins the quest as a Priestess whose original mission was to find the rogue Priest and bring him back home. The scenes set inside Cathedral City reminded me a lot of “Blade Runner” in the level of detail and sheer griminess. This is one of those movies where everybody wears black, looks like they haven’t bathed in days and nobody has any fun whatsoever. It’s a pleasure when Priest gets on his badass motorcycle that is little more than a jet engine with handlebars and tires and goes tearing out into the wasteland. At least then we get some sun. 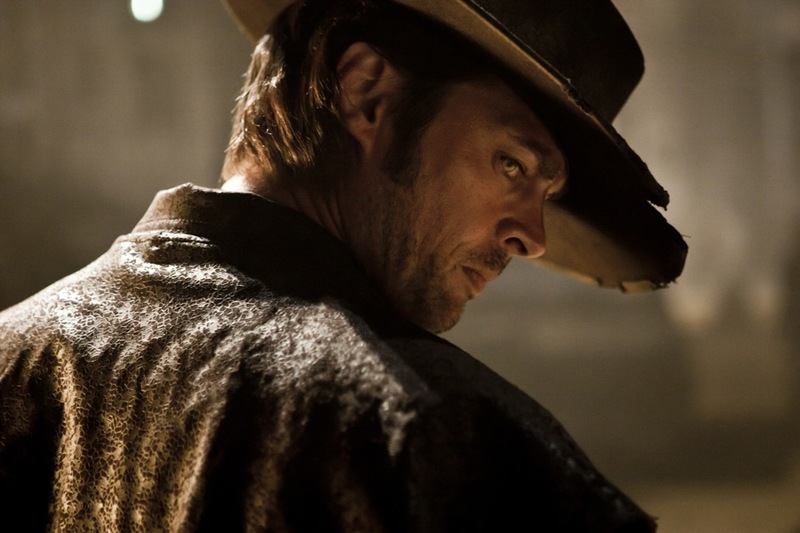 Karl Urban walks away with the acting honors in this one. He relishes playing a bad guy and in his broad brimmed black hat and flapping black duster, he could have walked right out of a Sergio Leone western. Brad Dourif shows up as a hustler selling vampire bite oil. So should you see PRIEST? Yeah. It’s by no means a must see or classic but it does have a solid story working for it and these days, any action movie that doesn’t use shaky-cam is alright by me. Scott Stewart knows how to direct exciting action/fight scenes and he knows how to keep the story moving. This movie is a major step up from his previous disappointment “Legion”. And as I said earlier, PRIEST is a lean 87 minutes so there’s absolutely no fat or padding on it. No, there’s not much characterization or Oscar-level acting but let’s face it, that’s not what you look for in a movie like PRIEST. 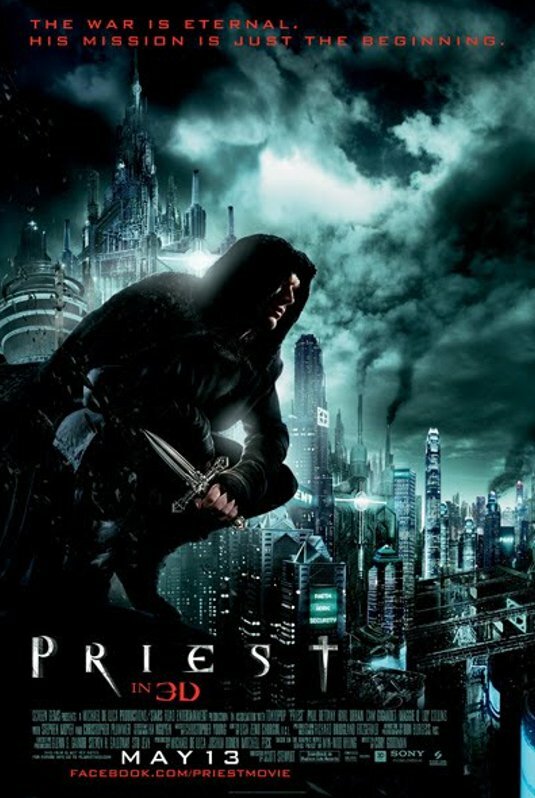 You look for action, cool fight scenes, impressive visuals, big scary monsters, wicked villains and heroes to root for and that’s exactly what PRIEST delivers. Enjoy. The movie was pretty decent. Definitely agree with your review. Have to say that the source material was much more intriguing. Multi-layered and had more character development. Some good stuff, depending on your taste in comics.